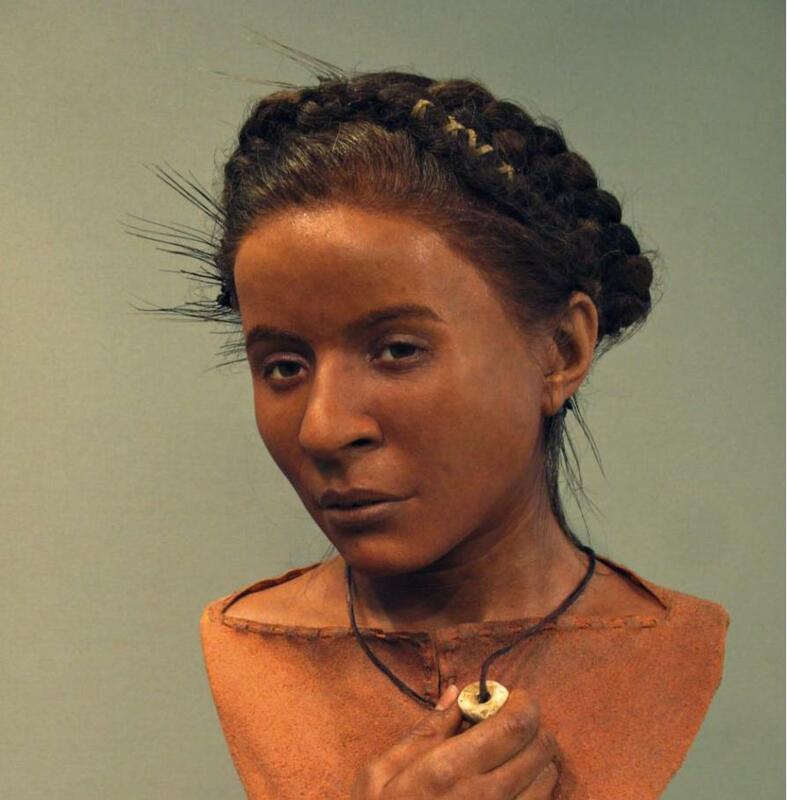 Neolithic woman from Britain: except for too dark skin, she just looks like a pretty British woman to me. Unless these are individual results, she's too dark for British Neolithic. Bell Beaker man from Britain: Doesn't much look like a warrior to me. I can't tell from the article whether the person doing the reconstruction used individual dna results for the pigmentation or just general ones. The information about Beaker people is incorrect. From the snp data we have of the Beaker people who went to Britain, they were NOT mostly blonde haired and light eyed. Honestly, I don't know if journalism should be called a profession anymore if even National Geographic prints crap like this. What a mess. Typical of the ancient remains we see, they lived horrible lives, and died horrible deaths. No, a lot of the Neolithic Brits weren't blonde. Do you just decide to make things up instead of doing the research? I don't want to see you insisting without a link to a paper which finds that. Am I clear? 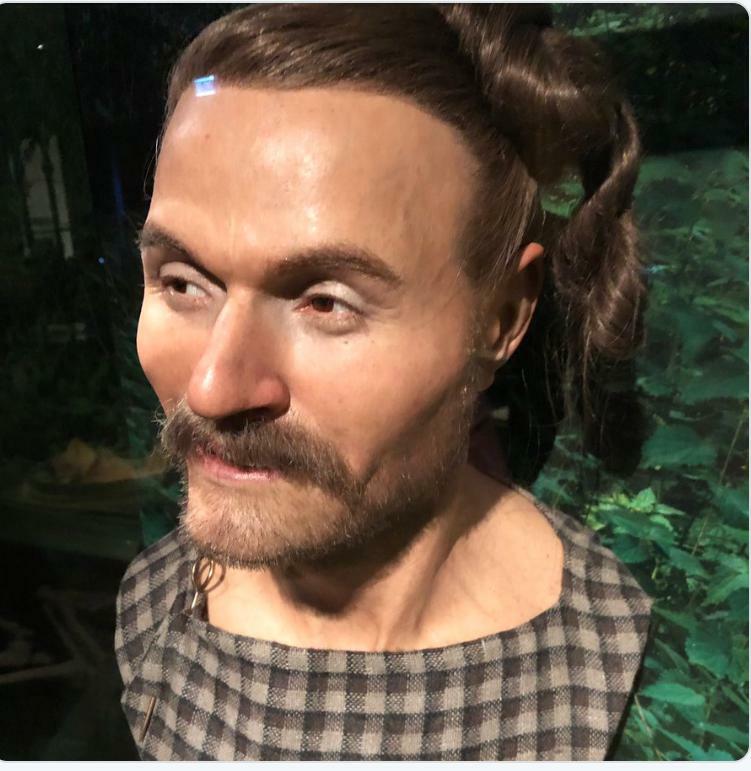 I'll grant you that Roman Era Briton is an Arya type, but Ango-Saxon man looks right to me: Danish, Scandinavian like, whereas the handsome Iron Age one looks "Celtic fringe". A lot is maybe the wrong word, but a surprising amount were - at least if you believe Genetiker. 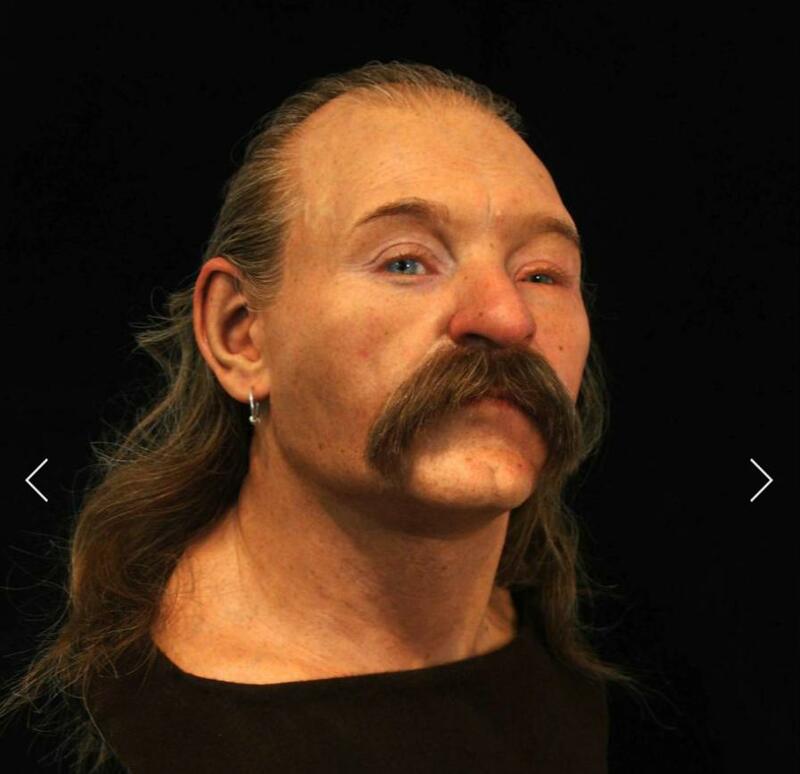 The Anglo-Saxon man is also definitely too dark to be a typical Scandinavian, most e.g. Danes have the standard Nordic combination of pale skin and light hair, but there are also darker types like Mads Mikkelsen. Most Danes would be noticeably non-British amongst a small crowd of Brits though, the pigmentation difference is quite large in general. As for the Iron Age one - he definitely passes as Celtic fringe, but on the dark side of the spectrum. But still passable. Well, that would be quite odd since the Anglo Saxons came from the area of Denmark and in some areas of Britain they account for 30-40% of the autosomal inheritance! It's usually important to know something about the subject matter before posting. Unless Genetiker used a forensic prediction algorithm there's no way of knowing that his prediction about someone being blonde and blue-eyed was correct. Single snps don't count. That's elementary. However, even by his standards, there are precisely four out of forty Neolithic people who were blonde and blue eyed, and the vast majority were also brown eyed, so, YOU ARE SPREADING FALSE INFORMATION AGAIN. Can you do the math? There are 7 out of 28 blonde, blue eyed British Beakers in his list. The percentages are about that or less for the continent. In Bronze Age Britain the percentages are even less. Everything you learned about pigmentation in Europe is WRONG. You are skating on very thin ice. The next time you post egregiously incorrect information which you clearly haven't checked, you're going to get an infraction. It happens too often for it just to be carelessness. Well, that would be quite odd since the Anglo Saxons came from the area of Denmark! What are you talking about, I was comparing the Anglo-Saxon reconstruction to modern Danes to show why he's too dark (as the Anglo-Saxons surely resembled modern Danes). Do you really suggest I don't know the history of the Angles, Saxons and Jutes? And 10% blondism (I thought it was more but I'll go with your figure) is still higher than would be expected from a Sardinian-like population, there's no way 10% of Sardinians are blonde - that was my point, the top reconstruction was way too dark, as it should be at least as dark as Sardinians if not lighter. Calm down, everything is simpler than it looks. First, you claim Wikipedia is run by Nordicists. Then, you doubt that I'm actually Jewish. Now, that I'm spreading propaganda about pigmentation? I don't even think the Bell Beakers were majority blonde, and definitely not the Neolithic population of Britain. This is what you WROTE: Top one is way too dark, especially when a lot of the Neolithic Brits were blonde. It's completely and utterly wrong. You misrepresent what the sources you are citing say. You have said in other threads that the British Bell Beakers were blonde and blue eyed. WRONG again. You proclaim that the British and the Danes don't share some phenotypes when in some areas 30-40% of the autosomal ancestry is from DENMARK, and that's without considering the actual "DANISH" migrations. You know, as in the DANELAW in England, or is that a new concept, like the one about how the Angles and Saxons came from today's Denmark or from closely related people? How many times can someone be wrong in one thread? These are not opinions, people. THESE ARE FACTS. You're all entitled to your own opinions, but you're NOT entitled to your own facts. Where did I say the British Bell Beakers were blonde and blue eyed? I don't recall saying that, do you mind providing me with a link to where I said this? The learning disability look as you called it seems to be maxillary hypoplasia, nothing to do with the reconstruction. Weston A. Price observed that this condition is very common in populations with inadequate nutrition. Many metal age skeletons are in bad shape when it comes to development. These folks probably had horrible lives and ate low quality food. Indeed, as I also pointed out. The linked article specifically states that the sample in question showed signs of several periods of malnutrition in childhood. The young Neolithic woman died in childbirth at 25, the Roman Briton woman died young and yet still had diseases of the spine and joints from hard, physical work, and the Anglo-Saxon man died at 45 probably of a huge dental abscess, and already had severe arthritis all over him. The only one who was relatively healthy was the Iron Age man, and he still died in his late twenties. It's the same for many of the samples we have. Life was, to quote Hobbes: nasty, brutish and short. I remember the surprise at the condition of the Langobard samples and some of the Corded Ware samples. People have romanticized ideas of the past. Actually that Neolithic woman reconstruction looks darker than the average Pardo Brazilians. Also, the skin tone and especially the pigmentation of her lips looks very unnatural, not the usual darker hues (either chocolate-like, reddish or copper-like) we see in most darker-skinned but not black people... She doesn't look like a real person in my opinion. I'm not sure there is an agenda, if there were I'm pretty certain they'd insist on making dark-skinned reconstructions of Bell Beaker and other Bronze Age and Iron Age people of Europe especially in the case of Britain in particular, where the reports have already informed people that there was a huge population replacement during the Bronze Age, so Neolithic Britain is not a very relevant ancestor to modern Britons. And where did you see that Neolithic Britons were often blonde? I never read that information. In my opinion Sardinianis probably did also undergo some selection for lighter skin as all other populations since the Early Neolithic, so to be fair I don't think the earlier European farmers were "Pardo Brazilians", but they weren't like modern Sardinians either. My bet is that their skin color at first resembled that of average modern Palestinians (not those with more visible North African or Subsaharan ancestry, though, of course). What I find intriguing is that most of the samples I have seen in aDNA and anthropology papers seem to deny the position that I have read more and more often as time passes by: that people got it all wrong when the statistical estimates about life expectancy concluded that the average was around 25-30, because that was virtually only because of the very high infant and early childhood mortality, but if you survived childhood then you'd be likely to live more than 50 and not seldom more than 60 years. Well, I don't recall having seen virtually any sample older than 50 in the last years in all these reports and papers. That's weird. I'm pretty sure most people would be completely shocked if they got a time machine and traveled to visit their favorite old societies. Even the majority of the population in the most glorious civilizations would probably look and live more or less like the poor people in the poorest nations of the world today - only even (much) worse. It was certainly not a very pretty picture (maybe except for a much more well preserved and thriving environment) despite all the work they did (in their folk art) to bring some beauty and meaning to their lives. EDIT: By the way I didn't quite understand the "possible crime scene" in the grave of the Roman Era British woman. Nails were found in her back and knees. Nails? What kind of murder would that have been? I've also noticed how young people were when they died. In the Metal Ages usually you'll get one older warrior, who no doubt got the best food, but even he usually died by his late 40s, early 50s. If this pattern holds true once we have a lot of samples, perhaps this may turn out to be another truism which will be falsified by ancient dna. I do agree that the best time to be alive is right now. However, there's a certain relativity even between ancient cultures. To quote Gibbons: "If a man were called to fix the period in the history of the world during which the condition of the human race was most happy and prosperous, he would, without hesitation, name that which elapsed from the death of Domitian to the accession of Commodus." I would add peaceful. They didn't call it the Pax Romana for nothing. :) In terms of my own area in Italy, for example, we didn't get back to the levels of the Empire until the 19th century. Of course, none of this applies if you were some slave on a galley, and there were no antibiotics and vaccinations, and eventually there would be cold and the plague, so there is that. Good times never last. Gibbons also was looking at things from his prism of Britain as the " new empire". Yes, I thought that was really bizarre too. I immediately thought of some sort of crucifixion, but why the back and knees? Maybe she was nailed in place so she couldn't move? In other areas we've had remains which were covered with stones, perhaps to present the spirit from rising. Ghoulish. The 'Resident of Roman Britain' woman, reminds me of the female cattle rustler in the Rob Roy film, that starred Liam Neeson. Small and slender, Whitehawk Woman lived about 5,600 years ago and died before the age of 25, possibly during childbirth (the remains of a fetus were found in her pelvic area). She was excavated in 1933 from a burial in the Whitehawk Enclosure, one of Britain’s earliest Neolithic monuments. 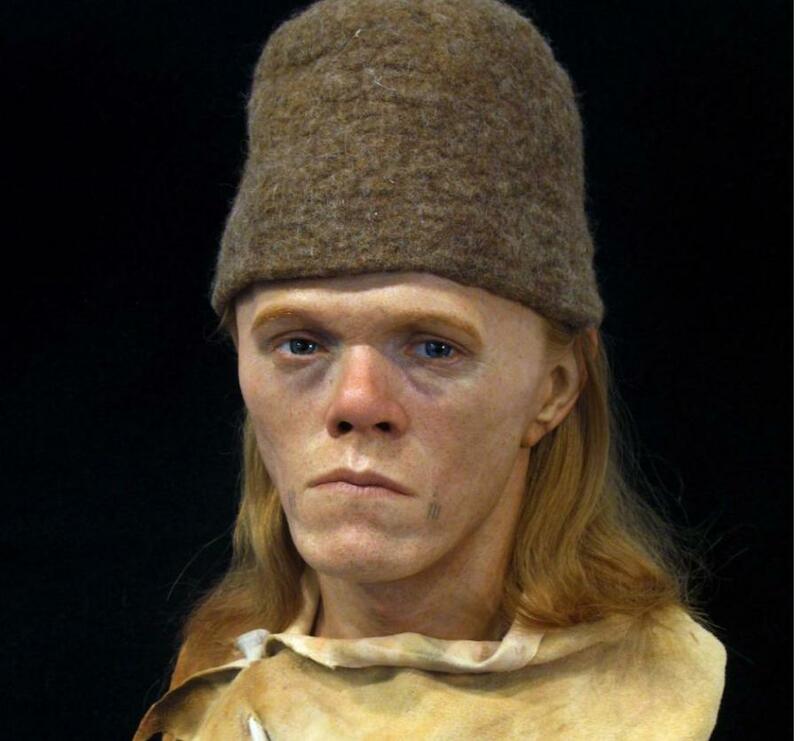 Recent DNA analysis from the Neolithic Whitehawk population suggests they were generally dark eyed and dark skinned in comparison to the Beaker population that eventually replaced them around 4,400 years ago. 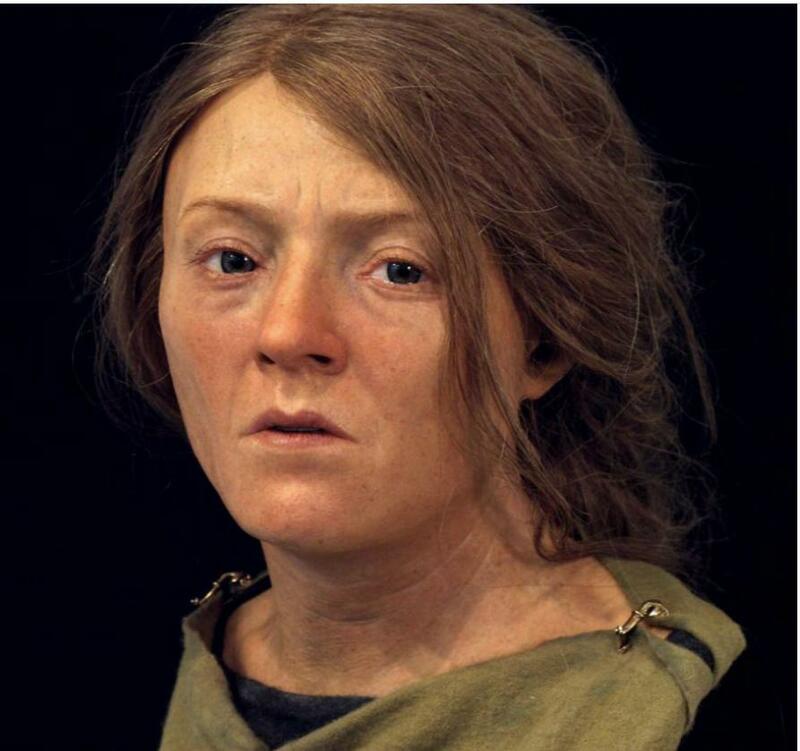 The National Geographic article suggests that Whitehawk Woman's facial reconstruction is largely based on the recent Beaker Complex paper from David Reich's lab. Olalde et al. 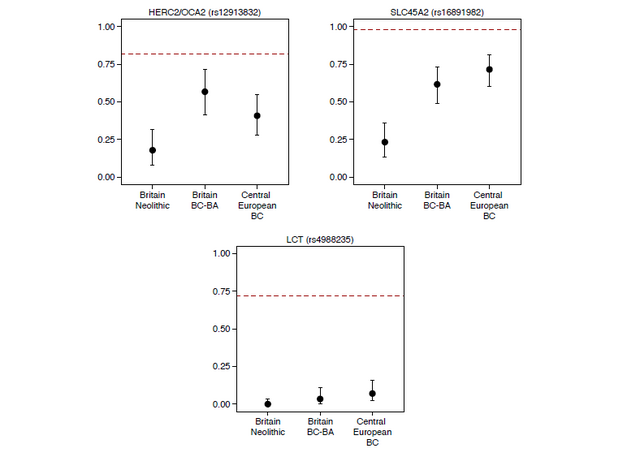 (2018) found that the frequencies of SLC45A2 and HERC2/OCA2 were much lower in the Neolithic population in Britain in comparison to the Beaker population. The arrival of Beaker migrants significantly altered the pigmentation phenotypes of British populations. Our genetic time transect in Britain also allowed us to track the frequencies of alleles with known phenotypic effects. Derived alleles at rs16891982 (SLC45A2) and rs12913832 (HERC2/OCA2), which contribute to reduced skin and eye pigmentation in Europeans, dramatically increased in frequency between the Neolithic period and the Beaker and Bronze Age periods (Extended Data Fig. 7). Thus, the arrival of migrants associated with the Beaker Complex significantly altered the pigmentation phenotypes of British populations. Last edited by gidai; 05-02-19 at 09:26. Yeah, their allele frequency for rs16891982 was much lower than any modern European population I've seen. Sardinians in ALFRED have like 70% of the derived allele where British Neolithic has 25%, which is comparable to Bedouin or Pashtun. Most Europeans have 90% plus. I had the same feeling as Ygorcs, her skin colour doesn't look like any real skin colour I can think of. Yes, I also thought of Palestinians or maybe Arabians as the best proxies for the least depigmented ANF/EEF populations. The average would be more like Sardinians, and the lightest (e.g. GAC) more like Basques. But that skin color just looks unreal. That's because some people fail to understand that they aren't looking at the original Anatolian Farmers. That girl had darker complexion probably because she partly descended from a local WHG ancestor not too far ago. It's the same as with the GAC samples who had a high incidence of blue eyes and blondism. That's again due to mixing and in their case it was with EHG groups. However GAC was still leading a Farmer style of life. GAC seem to have been lighter than both EHG and SHG. Definitely the great-great-... Grandfather of Wayne Rooney. Also the woman from the Roman Period looks very British to me. I haven't looked at the data for a long time, but my recollection was that perhaps a few SHG in their far northern locale had a few blonde, blue-eyed and fair skinned people, but the EHG themselves were fair skinned, but mostly brown haired and eyed? Is there data to the contrary? Also, what were the more eastern populations known to contribute to GAC? What do the papers say about the pigmentation of those people? As I mentioned in the first post, it's unclear to me whether these reconstructions were based on the individual snps of the individual samples or the general pigmentation information about the various eras. For example, Bell Beakers did have lighter skin on average than British Neolithic, but Genetiker's percentage of blue eyed blondes for them is less than 25%, and as I also said, I've never seen any statement from him as to whether he uses a recognized forensic program. Do you have the academic results for GAC handy? I don't remember those positing all these blue eyed blondes. So much information has come out, and so many people have made pronouncements which are time consuming to fact check that it's all gotten somewhat confusing. Mathiesen is also confusing to use because he lumped together WHG, SHG and EHG to get his "HG" figure. That isn't helpful at all. The pictures don't show up. If you just post the link that would be helpful. I just remembered Spitalfields Woman, a Roman woman buried in Britain. "In 1999, archaeologists were excavating a medieval graveyard when they found an enigmatic woman. Located at Spitalfields outside the Roman city of Londinium, her case was as unique as it was unexpected.An enormous stone sarcophagus contained a lead casket decorated with scallops. At the very heart were the bones, once dressed in gold-embroidered silk. The woman’s affluence and artifacts placed her death at around AD 350. Beyond that, little else was certain. Two things suggested that she followed an Eastern mystery cult. Several arose during the fourth century, including Christianity. The scallop shell was a Christian symbol, but researchers believe that the woman chose another, somewhat merrier cult. The second religious connection was a flask. The glass item resembled another found in a French burial, which had contained wine. Around this time, London’s Temple of Mithras belonged to Bacchus, the god of wine. Analysis of her teeth showed that she was not native to Britain. The theory that she hailed from France or Spain left her facial reconstruction with distinctive dark looks. Dental isotopes eventually revealed the woman as the only verified person from Roman Britain born in Rome." They really should redo the reconstruction now that better tools are available. I think she looks a bit like the British Neolithic woman only fairer.